Did you see the post from J.Crew Aficionada about Madewell coming to Nordstrom and Net-a-Porter? I have a Madewell store in the nearby mall, so it doesn't make a huge difference to me, but I think this is great news to those who don't. I love Nordstrom! Madewell has some great boots and bags. I was dying for Rag and Bone ankle booties last year but could not justify the price and Madewell had some good alternatives (Billie!). I ended up not buying them, but only because I was so wrapped up in the house decorating madness. But last summer I needed a few new t-shirts and Madewell had just the styles. I think they are a little edgier and trendier than J.Crew but still without logos and unnecessary embellishments. In fact, their striped linen tee has been one of my favorite items recently. Yes. To the point that when I look at my iPhone pictures, it sometimes seems like that's the only t-shirt I own! I also seem to be drinking a lot of champagne, but that's a good thing, right? Here I am, rowing in the Central Park, dressed in almost all-Madewell outfit. The white vest was another one of my favs, It can instantly turn even your shorts-and-tee outfit into something chic. And I wore that necklace to death. Quite literally, as one day the chain came apart and it was all little pieces all over the floor. So OK, maybe it is not such a great quality, but I still loved it while it lasted (kind of like my ex, but nevermind). I saw this necklace on some TV personalities, including Joanna Gaines from Fixer Upper. I love her style, don;t you? They now have something quite similar, called Arrowstack necklace. Here is that t-shirt again, this time with my Rag and Bone Fedora. I also bought it in red and solid gray (the t-shirt, not the hat), but somehow I did not wear those that often. Contrary to the care label washing instructions, I just wash them on a regular cycle. Who has time to hand wash the t-shirts? They do shrink if you put them in the dryer but they will stretch again in the next wash. 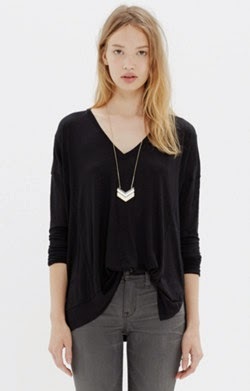 I also like their viscose slouchy v-neck tees, they drape well and they are supersoft. That said, they do sometimes develop those annoying little holes in front. I gave up on it and just assume they will not last more than one season. Oh well. For now, I realized that I need a couple of long sleeve t-shirts, as I seem to have 'outgrown' most of what I have in my closet. Sigh. I even suggested to my boyfriend that maybe if he dumped me, I started losing some weight, being brokenhearted and such, but buying couple of things in a bigger size may be a more pleasant solution. Don't worry, eventually I may skip some of the DD breakfasts and may even get back to an exercise routine, lol. She is wearing my necklace! I should have gone to the store to try it on, but I am too lazy. That's what happens when you start getting fat like Meghan Trainor too much. Btw, why is everything cropped these days? I can't do cropped! What do you think? Do you buy from Madewell? Do you own any of the t-shirts I ordered? Please chime in, it would be no fun without you! Your striped shirt is perfect! I have never tried a Madewell shirt, I ordered some dresses from Madewell a long time ago but returned them, too short. I don't really look at their site very often, the most recent thing I looked at was a black leather motorcycle jacket that my friend Jules was totally obsessed with, very much her style but I don't think she took the plunge, it was quite pricey with our low dollar factored in. I always think they are not really my style but I like the drapey look of those t shirts. I haven't been buying anything, not even from my favourite Brora sale. The low Canadian dollar combined with the fact that all of my money went to our renovation means I can afford the occasional ebay item (I still look for 2008 JCrew stuff)...but that's about it. I am so excited to see you posting again. I have little experience with madewell as I only have a Bien fait sweatshirt & a sea life tee. Maybe someday we will get a store nearby but it is probably better for my budget if we don't. Never bought clothes from madewell, a couple of scarves is all, but like Dani, not buying at all, not even ebay these days. I will buy some things in New York I know, but actually, I think I will buy local in 2015 for the most part. My ups man already misses me! My ups man know must now refer to me as 'Wayfair/Joss and Main nut', not 'JCrew Addict', lol. So excited about our NYC meeting! Welcome back!!! This is the first of your new posts that I have seen -- saw you in the sidebar of Wendy's blog. I have missed you; am glad to see that you are well!! Welcome back! You have been missed! I have wondered how you were and hoped that you and your girls were doing well. It's So nice to see you looking so happy and beautiful! Looking forward to hearing more from you! Hi A, my girls and me are doing great, thank you so much for asking! 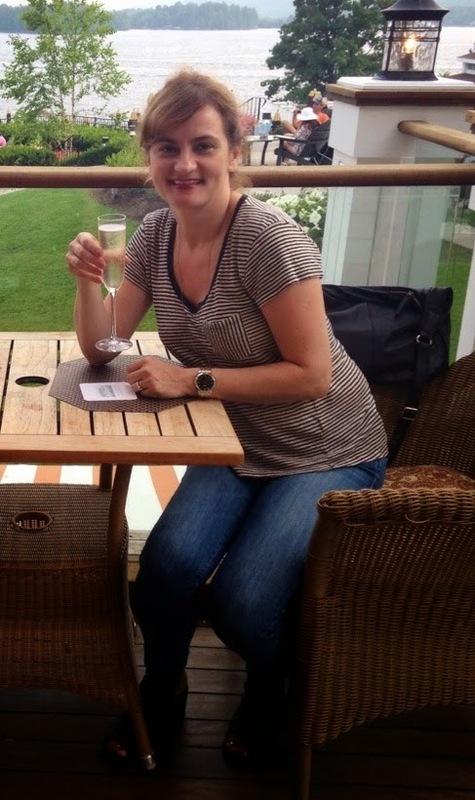 You look great in that striped shirt, and yes - champagne is ALWAYS a good thing! I have several pairs of jeans from Madewell, and I love them. I go for high rise. I also have several pairs of their Skimmer flats from a couple of years ago and wear them quite often (I usually wear size 7 but went up to 7.5 in those). My mother always sad that champagne goes with everything and it was essential in good diet, she is one smart lady isn't she? I just got a pair of legging jean because I wanted something comfy that does not look sloppy, I think they fit the bill. And I brought in my old jeans for $20 off, so the price was reasonable too, under $50. AJC, so lovely to see you back on your own blog and re. possible WMM meet-up. Have been meaning to say hellosies for a few days. I have a striped tee addiction I don't intend to break. Does that make it a style statement? Like Dani and Wendy, curtailed by the Canadian dollar although I did pick up my annual Brora cardi. With black basics I think shape and fit, interesting details make such a difference. Interested to hear what you think of your first tee pick when it arrives (beautifully drapey or too messy?) Again, pleased you are back in the blogosphere and in fine form, keep it up! Hello GetFresh, thanks for stopping by and yes, I am super excited about the bloggies get together, what a treat! Yes, I love those stripped shirts, I actually have a separate shelf just for them. "Obsessed much?" my daughter laughs. P.S. Crushing on your Rag & Bone fedora, it truly complements you. I too have been gaining a bit of weight (long story) but actually, to my surprise, people tell me they can't put a finger on it but that I look great. I think the same is true here, you look fantastic, and sound happy, and that's all we really want for you, beautiful lady. SO glad you're back, great to read about your adventures again! And totally jelly of the WMM meet up!